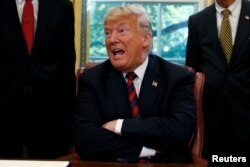 Several U.S. lawmakers broke with President Donald Trump on Sunday, disagreeing with his assessment that it was uncertain whether Saudi Crown Prince Mohammed bin Salman was involved in the killing of a Saudi dissident journalist inside Riyadh's consulate in Istanbul. Congressman Adam Schiff, set to become the chairman of the House Intelligence Committee when Democrats take control of the House in January, told CNN, "I have been briefed by the CIA and, while I cannot discuss the contents of the briefing in any way, I can say that I think the president is being dishonest with the American people." 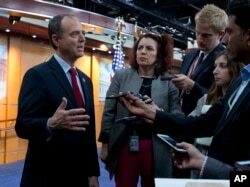 FILE - Rep. Adam Schiff, D-California, ranking member of the House Intelligence Committee, speaks with reporters after a news conference in Washington, July 17, 2018. Trump last week said the U.S. would stand by Saudi Arabia and that he did not know whether the crown prince had knowledge in advance of the killing of Jamal Khashoggi. While living in the U.S., Khashoggi wrote opinion columns for The Washington Post that were critical of Mohammed bin Salman and Riyadh's involvement in the long-running Yemen conflict. "It could very well be that the crown prince had knowledge of this tragic event – maybe he did and maybe he didn’t!" Trump said. Trump concluded, "In any case, our relationship is with the Kingdom of Saudi Arabia. They have been a great ally in our very important fight against Iran. The United States intends to remain a steadfast partner of Saudi Arabia to ensure the interests of our country, Israel and all other partners in the region." Senator Mike Lee, a Utah Republican, also disputed Trump's equivocation on whether the crown prince had knowledgeable of the Khashoggi killing. "I disagree with the president's assessment," Lee told NBC's "Meet the Press." "It's inconsistent with the intelligence I've seen," which implicates the crown prince. FILE - U.S. President Donald Trump talks to reporters about the killing of Saudi journalist Jamal Khashoggi, following a bill signing ceremony at the White House in Washington, Oct. 23, 2018. Another Republican, Senator Joni Ernst of Iowa, said on CNN, "I do think we need to look into this further." She said that while Saudi Arabia is a strategic partner of the U.S., "We also are a very strong nation when it comes to human rights, when it comes to the rule of law. And if there are indicators that the [crown] prince was involved in this murder, then we need to absolutely consider further action." Ernst said she did not think Trump was exonerating Saudi Arabia, but added, "I think at such a time when it becomes necessary, the president also needs to speak directly to the Saudis and say enough is enough." 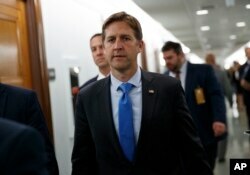 Republican Senator Ben Sasse of Nebraska, a frequent Trump critic, said on Fox News, "Making the realist case (about the need for a U.S.-Saudi alliance) is a different thing than being so weak that we failed to tell the truth." He said Mohammed bin Salman "contributed to murdering somebody abroad and it is not strength to sort of mumble past that. Strength is telling the truth even when it's hard." FILE - Sen. Ben Sasse, R-Nebraska, returns to a Senate Judiciary Committee hearing after a break on Capitol Hill in Washington, Sept. 27, 2018. Numerous U.S. lawmakers have said they intend to push for U.S. sanctions against Saudi Arabia because of Khashoggi's killing. Trump, in his statement last week, said, "I will consider whatever ideas are presented to me, but only if they are consistent with the absolute security and safety of America." He said, "After the United States, Saudi Arabia is the largest oil producing nation in the world. They have worked closely with us and have been very responsive to my requests to keeping oil prices at reasonable levels – so important for the world. As president of the United States I intend to ensure that, in a very dangerous world, America is pursuing its national interests and vigorously contesting countries that wish to do us harm. Very simply it is called America First!"